The Council for Higher Education Accreditation (CHEA) International Quality Group (CIQG) has announced the winners of the 2018 CIQG Quality Award: Conestoga College Institute of Technology and Advanced Learning and Western Governors University. 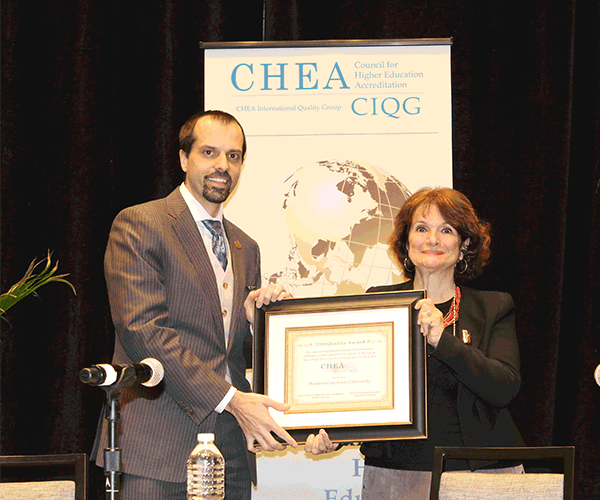 Lucas Kavlie of Western Governors University receives the CIQG Quality Award plaque from CHEA Senior Advisor on International Affairs Stamenka Uvalić-Trumbić. International Quality Principles. "The award is a celebration of good practice and a demonstration of the major stake that higher education providers have in improving quality around the world," said Concepcion Pijano, an international consultant on accreditation and chair of the CIQG Advisory Council. 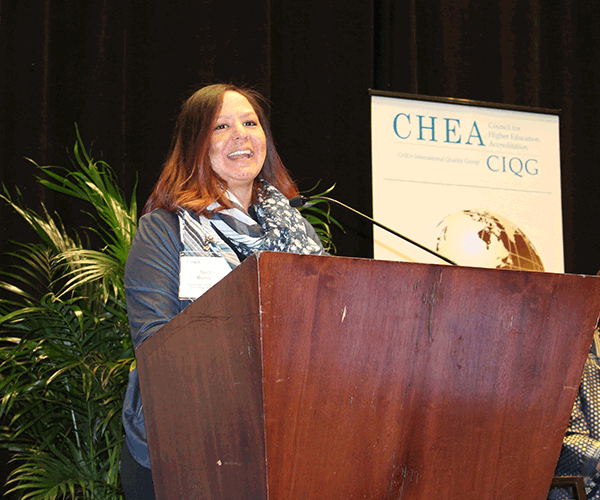 "This award is part of trying to build international investment in higher education quality and quality assurance," said Stamenka Uvalić-Trumbić, CHEA Senior Advisor on International Affairs. Conestoga College Institute of Technology and Advanced Learning, is a public college located in Kitchener, Ontario, Canada.The college uses key data from external benchmarking exams and survey results to assess and track student outcomes, undertake short- and long-term planning and implement changes to improve outcomes. Sacha Burrows of Conestoga College Institute of Technology and Advanced Learning speaks at the CIQG Quality Award presentation ceremony. Western Governors University (WGU) is a private, nonprofit, online university based in Salt Lake City, Utah. The university, which uses a competency-based learning model with students working online, monitors its performance in key areas and works for continuous improvements and adjustments to improve the quality of students' educational experience. Sacha Burrows, Conestoga's Manager of Degree Quality and Lucas Kavlie, WGU's Vice President of Compliance and Accreditation, received the awards at a ceremony held during the 2019 CIQG Annual Meeting (January 30-31) in Washington, DC. "We applaud Conestoga College and Western Governors University for their commitment to advancing higher education quality," noted CHEA President Judith Eaton. Members of the international judging committee included Carolyn Campbell, Senior Consultant and Board Member of the Observatory on Borderless Education; Peter Okebukola, President of the Global University Network for Innovation - Africa; Concepcion Pijano, and Jamil Salmi, global tertiary education expert and former Tertiary Education Coordinator for the World Bank.